Tomorrow's Cities will be like sparkling jewels on the landscape — filled with radiant beauty, with peace and prosperity, with happy, healthy people. Mankind will never have seen anything like it! Sound too good to be true? Sound impossible? It isn't. Such cities ARE COMING — and that before the end of this century! But WHERE will they be built? And WHO will build them — and HOW? BASIC plans for these fabulous cities have already been drawn up. All the necessary resources to see this entire plan through to successful completion are available. The plan is already so far along that a select group is right now being given topflight training to qualify for future responsibilities as administrators of these cities. Everything is being carefully worked out. Nothing is being left to chance. The major problems of today's cities will be completely solved in advance before construction on Tomorrow's Cities ever begins. Today's cities are a mess. And the bigger the city, chances are, the bigger that mess is. Today, city air is laden with every kind of foul pollutant imaginable. Noxious soot, dust and chemical debris from industry. Toxic monoxide fumes and lead from hundreds of thousands of motor vehicles. Stale, filthy smoke from the millions of cigarettes smoked daily. In some big-city areas multiple tons-per-square-mile of such refuse and waste float down every single month! City water has frequently been reused oftener than anyone cares to remember. The water being used in one city today has often been flushed down a commode and into the sewer in another city just a few days before. The food eaten by city dwellers — probably grown on depleted soil to begin with — has been waxed, polished, colored, pasteurized, homogenized, taken apart, preserved and chemically "enriched" until it contains pathetically little nourishment. The noise level is right on the brink of what the human mind can tolerate and still remain sane. The normal working day's routine for many begins and ends with a nerve-wracking fight through miserably congested traffic. And what are the sights along the way (besides the back end of the car in front of you)? A miserable jungle-like labyrinth of steel, glass, wire, asphalt and cement — of streets, supermarkets, shopping centers, housing tracts, office buildings, railroad tracks, electrical lines and industrial smokestacks. A helter-skelter conglomeration of unsightly billboards and gaudy neon signs. A sickening bluish-yellow haze called smog. Small wonder so many people seek escape! But these are by no means the only problems. In today's cities personal safety is almost nonexistent. Without God's protection you aren't safe anywhere — not even in your own home. Not even with an elaborate system of locks. And on the street? Anything can happen! Day or night. The danger on city streets is no longer confined to traffic accidents. Today, the "normal" street dangers include the possibility of being robbed, assaulted, stabbed or murdered. They include the constant danger of someone suddenly going raving mad and shooting everyone in sight. In certain areas, especially at night, the streets have plenty of motor traffic, but the sidewalks are empty. And if you do see an occasional person on the sidewalk, you immediately wonder whether he is about to commit a crime or if he has lost his mental balance. This is the shocking point to which we have progressed — or retrogressed — in this "enlightened" 20th century! Huge sections of cities are designated as "crime containment zones." Poverty, unemployment, overwhelming welfare loads, wall-to-wall children, illegitimacy, looting, riots, racial tensions, savage gangs, and schools called "blackboard jungles" are the trademarks of these areas. Here crimes of every description run so rampant that the police hope, at best, merely to keep this "excessive" crime from spilling over into other areas. Farther downtown there is the bowery or skid row. Its trademark is cheap hotels and saloons, filled with hopeless derelicts, dope addicts, prostitutes and similar types of degenerate humanity. And out in suburbia — in the nice part of town? Well, the problems of today's society are here, too. The houses out here may have two-car garages, boats and double ovens. But they also have family strife, broken homes and divorce. The fear of not being able to meet next month's payments on the house, car, boat, stereo and color TV. Envy at the neighbors next door who just installed a backyard swimming pool and are planning a trip to Europe. Bored with the blessings of life — but coveting more — many of the inhabitants of suburbia seek escape in the excitement of wild, permissive parties — replete with alcohol, drugs, and sexual debauchery. And the younger suburbians, with too much free time on their hands and with too little parental supervision, run the usual gamut of licentiousness from vandalism and crime to promiscuity and LSD. At every level of city society and in every part of town, we see serious problems in need of a solution. And we have yet to mention the matters of corrupt business practices, bribery, cheating, bitter labor disputes, organized crime, payoffs, weak and ineffective city government and exorbitant taxes. Add all these problems together and you can begin to comprehend what a tremendous top-to-bottom CHANGE is necessary for our cities to become decent places in which to live. But thank God, such a change is coming — and soon! But HOW? WHO and WHAT will bring it about? Where would you start if YOU were responsible for undertaking such a gigantic project? Today men seek to solve the problems of our cities by money, schools, integration, night lights to deter criminals, new laws, more police, etc. But all these methods ignore the basic reason today's cities are the way they are. What is the biggest problem in cities today? What makes cities so bad? It's people! It's the fellow who takes off for work in the morning with his eyes filled with smog and other depressing sights, a hostile look on his face, the din of traffic in his ears, his lungs and nostrils full of foul air and cigarette smoke, his stomach full of nutritionally raped food, his veins full of drugs and tranquilizers, and his mind filled with the violence of the previous night's TV programs or his plans to beat the other guy out of as much as he can when he gets to work. HE'S the problem in today's cities — along with millions of men and women just like him. And what is it that makes people so bad? It's their unconquered HUMAN NATURE. This nature is a nature of vanity, jealousy, lust and greed. In Tomorrow's Cities, this basic cause of human suffering is going to be solved first. Human nature will be changed. But HOW? Through the prophet Ezekiel God gives us the answer: "A new heart also will I give you, and a new spirit will I put within you: and I will take away the stony heart out of your flesh, and I will give you an heart of flesh. And I will put my spirit within you, and cause you to walk in my statutes, and ye shall keep my judgments, and do them.... I will also cause you to dwell in the cities and the wastes shall be builded" (Ezek. 36:26-28, 33). See also Jeremiah 31:31-33 and Hebrews 8:10. Human nature will still exist in Tomorrow's Cities. The inhabitants of these cities will still be physical, flesh-and-blood human beings. But God is going to give these people His power — His Holy Spirit to resist and overcome the downward pull of their human nature. They will be able to direct, control and guide their lives into constructive channels. They will obey God's laws. They will live in the way that brings peace, happiness and prosperity for all. God's Holy Spirit is available today. But mankind as a whole is not interested in God's Spirit. Man is by nature hostile to God and thinks he can solve his problems without God's help. He won't submit to God's way unless he is forced to. And that is where Tomorrow's mayors come in. The mayors in today's cities are little or no different from those over whom they rule. They, too, have human nature. They, too, are subject to vanity, jealousy, lust and greed — all too often increased because of their position. Mayors often must ignore urgent problems because to bring them out into the open and to suggest a concrete solution would offend a certain bloc of voters and wash their whole political career down the drain. And when a mayor does make a sound proposal for getting rid of some evil in his city, it often gets bogged down or lost entirely in a mountain of bureaucratic red tape or in political haggling. Meanwhile the city suffers on. Many mayors are mere figureheads. Their office sounds important and impressive, but in actual fact it is weak and rather powerless. The mayors of Tomorrow's Cities will have no such problems. They will possess the power they need. And they will not be motivated by greedy, selfish desires in using this power. They really WILL have the interest of their people at heart. The rulers of Tomorrow's Cities, as shocking as it may seem, will be divine Spirit Beings. They will be members of the God-Family, the Kingdom of God — immortal SPIRIT BEINGS ruling in God's Government on this earth under Jesus Christ! God has promised a position of rulership in the soon-coming World Tomorrow to ALL who by their lives in this present age — the world today — meet the conditions which God has laid down. "And he that overcometh [and that includes human nature] and keepeth my works unto the end, to him will I give power over the nations: And he shall rule them with a rod of iron" (Rev. 2:26-27). For some, this "power over the nations" is going to involve rulership over cities. This is shown by the parable of the pounds in Luke 19. In this parable example, rulership over five or ten cities is given to those who qualify. Those who overcome and produce more are given the greater rewards (verses 16-19). Those who fail to produce anything receive no reward (verses 20-27). God is going to appoint as Tomorrow's mayors those who qualify for positions of rulership over cities. For more details about the entire pattern of God's Government as it will be in the World Tomorrow, read our free booklet, The Wonderful World Tomorrow - What It Will Be Like. Tomorrow's Cities will be ruled by Spirit Beings who are God. And how will they rule? Why, with all the resources of wisdom, understanding, love, might and POWER of the God-Family! These rulers won't cater to some groups and individuals at the expense of others. They won't be influenced in the least by petty politics. Their rule will be just. They won't fear being thrown out of office by unruly troublemakers. They will possess the power to swiftly put down any self-exalting, rebellious elements. Neither will these rulers tolerate filth, shiftlessness and degeneracy. Today when the lower classes are put in new apartments and schools by the government, what happens? Do these people appreciate what they are given? In many cases, NO! In a period of months many new facilities have fixtures stolen, doors and windows are broken, the smell of urine may even be detected in halls and elevators and the whole place is a wreck! In Tomorrow's Cities people will be taught that this is not the way to live. They will simply not be allowed to be low class and degenerate. Those who insist on being that way will be punished so swiftly and surely that they will learn very quickly. And all will hear and fear! Yes, Tomorrow's mayors are going to force their subjects to obey God and to receive His blessings. They will impose a warm and merciful rule that will bring compulsory joy! They will insist on happiness for their citizens. They will demand plenty and goodness in their lives. And they will COMMAND them to be healthy, and filled with a sense of well-being and contentment! And most of these subjects will quickly learn that God's way is best. They will want God's Spirit to lead and guide them. They will desire to obey God's Laws. They will be converted, cooperative people. With this kind of rulers and this kind of subjects, the rest is a sheer joy to think about. Can Cities Be Clean, Beautiful Safe and Inspiring? Why can't city streets be clean, broad, tree-lined avenues interspersed with sparkling fountains, interesting malls and imaginative sculpture? Why can't the city's conglomeration of "bright lights" be arranged in beautiful, artistic schemes and designs? Why can't unsightly poles, conduits and wiring be universally hidden from view? Why can't gaudy neon signs be toned down and ugly billboards be eliminated? Why can't necessary information on buildings be done in neat lettering with good taste? Why can't city buildings have appealing architectural flair and design — complementing one another in an aesthetic, harmonious whole? Why can't public buildings, schools and churches be devoid of pagan symbols and be kept undefaced and unmarred? Why can't city air and water be clean and pure? Why can't dumping unnecessary soot, waste, refuse and chemicals into city air and water be stopped? Why can't industry be located in a separate part of the city, where its natural noise and dirt wouldn't affect the homes, schools and stores? Why can't cities have adequate parks and playgrounds with trees, shrubs, flowers, birds, animals, lakes and streams? Why can't cities have fast, efficient systems of transportation which will whisk people downtown without having to clog the street with their cars? Why can't cars be built so that they don't pollute the air? Why can't cities be safe? Why can't elderly people go for an evening stroll without being assaulted? Why can't children play without fear of being molested? Why can't people go shopping without fear of being robbed — either by a pickpocket or by the cheap, shoddy, misrepresented products they buy? The answers to all these questions — and dozens more like them is — THEY CAN! Cities CAN be clean, beautiful, safe and inspiring. But about the only hope of ever achieving these things in today's cities is to start from scratch! And that is exactly what is going to be done. But how? As we have already shown, in Tomorrow's Cities God is going to establish a program to rehabilitate human nature. As this program gets into full swing, the sociological problems — the problems of crime, violence, immorality, divorce, delinquency, etc. — will be solved. Then it will be possible to go to work on the physical aspects of the city — the streets, buildings, parks, homes, schools, transportation, etc. Here, too, God will start from scratch. But How? How can you start from scratch in cities like Chicago, New York, London, Sydney, Toronto, Johannesburg, Tokyo, or Manila? In the same way that Berlin, Warsaw, and other European cities started from scratch after they were destroyed in World War II! Yes, shocking as it may be, Bible prophecy reveals that our present-day cities are going to be devastated with all the destructive force of modern warfare! But WHY? God is going to allow our cities to be destroyed for the very reason that they are festering sores on the earth's face to begin with — and that reason is SIN! Our cities are full of sin. Of course all this could be avoided. "For if ye thoroughly amend your ways and your doings; if ye thoroughly execute judgment between a man and his neighbor; if ye oppress not the stranger, the fatherless, and the widow, and shed not innocent blood in this place, neither walk after other gods to your hurt: then will I cause you to dwell in this place, and in the land that I gave to your fathers, for ever and ever" (Jer. 7:5-7). If you do not yet recognize the application of Bible prophecies regarding "Israel" — such as this one from Jeremiah — to Britain and the U.S.A., please write immediately for our free book The United States and British Commonwealth in Prophecy. Yes, if we as a people would even now QUIT SINNING and turn to God, our land and cities could be spared from the catastrophes shortly to come. If we were willing to cooperate with God, He would make our cities decent places in which to live — without having to suffer the ravages of war. But human beings refuse to do this (Jer. 7:8-10, 28; 8:5-6, 9:5-6, 8). Yes, it is because of SIN that God is going to punish us and destroy our cities. Whole chapters and books of the Bible are devoted to warning us of this sobering REAL fact. "In all your dwelling places the cities shall be laid waste,... And mine eye shall not spare, neither will I have pity: I will recompense thee according to thy ways and thine abominations that are in the midst of thee; and ye shall know that I am the Lord that smiteth.... The sword is without, and the pestilence and the famine within: he that is in the field shall die with the sword; and he that is in the city, famine and pestilence shall devour him.... They shall cast their silver in the streets, and their gold shall be removed: their silver and their gold shall not be able to deliver them in the day of the wrath of the Lord... Make a chain: for the land is full of bloody crimes, and the city is full of violence. Wherefore I will bring the worst of the heathen, and they shall possess their houses... And ye shall know that I am the Lord: for ye have not walked in my statutes, neither executed my judgments, but have done after the manners of the heathen that are round about you... They shall eat their bread with carefulness, and drink their water with astonishment, that her land may be desolate from all that is therein, because of the violence of all them that dwell therein. And the cities that are inhabited shall be laid waste, and the land shall be desolate, and ye shall know that I am the Lord" (Ezek. 6:6 and 7:9, 15, 19, 23, 24; and 11:12 and 12:19, 20). What a terrible time of destruction that will be. But, thankfully the story doesn't end here! An All-wise God will have to deal with us in the only language we understand — PHYSICAL FORCE and PUNISHMENT. But once He has dealt with us in this way, and once we have learned our lesson, then Jesus Christ will return to this earth to set up God's Government. And then our cities will be rebuilt — this time GOD'S way. "For a small moment have I forsaken thee, but with great mercies will I gather thee. In a little wrath I hid my face from thee for a moment; but with everlasting kindness will I have mercy on thee, saith the Lord thy Redeemer... For thou shalt break forth on the right hand and on the left; and thy seed shall inherit the Gentiles, and make the desolate cities to be inhabited" (Isa. 54:7, 8, 3). "For God will save Zion, and will build the cities of Judah: that they may dwell there, and have it in possession. The seed also of his servants shall inherit it: and they that love his name shall dwell therein" (Psalm 69:35-36). When God sets His hand to build Tomorrow's Cities with the help of His Spirit Servants, how fantastic do you think those cities will be? They will be beautiful beyond description! "I will cause the captivity of Judah and the captivity of Israel to return, and will build them, as at the first... Again there shall be heard in this place, which ye say shall be desolate without man and without beast, even in the cities of Judah, and in the streets of Jerusalem, that are desolate, without man, and without inhabitant, and without beast, the voice of joy, and the voice of gladness, the voice of the bridegroom, and the voice of the bride, the voice of them that shall say, Praise the Lord of hosts: for the Lord is good, for his mercy endureth for ever" (Jer. 33:7, 10, 11). A city can only be as prosperous as the hinterland upon which it depends for its food and raw materials. In the World Tomorrow this problem will be solved, too. Agricultural prosperity will be unbelievably great in all rural areas. "And the desolate land [most of today's earth] shall be tilled, whereas it lay desolate in the sight of all that passed by. And they shall say, This land that was desolate is become like the garden of Eden; and the waste and desolate and ruined cities are become fenced, and are inhabited... I will increase them with men like a flock" (Ezek. 36:34, 35, 37). In the World Tomorrow, city dwellers aren't going to be crowded into small, cracker-box apartments with no backyards and almost no privacy. Instead, "They shall build the waste cities, and inhabit them; and they shall plant vineyards, and drink the wine thereof; they shall also make gardens, and eat the fruit of them" (Amos 9:14). Imagine! Gardens in the city! — actually growing food! And imagine people interested in having a garden and working in it! With good food and sufficient exercise, fresh air and sunshine, city people will be robust and healthy instead of pallid and sickly. 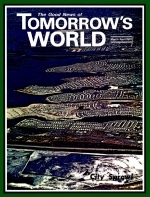 Yes, the cities of the World Tomorrow are going to be far superior to anything on earth today. God promises: "And I will multiply upon you man and beast, and they shall increase and bring fruit: and I will settle you after your old estates, and will do better unto you than at your beginnings: and ye shall know that I am the Lord" (Ezek. 36:11). In just a few short years Jerusalem will be the showcase city of the whole world. In the World Tomorrow it will be the world capital and the model city from which all other cities will get their example. It will be fabulous beyond description. Jesus Christ, as Chief Ruler, will make His dwelling there. With Him will be many other high-ranking Spirit Rulers and assistants who will help Him administer God's World Government. "Beautiful for situation, the joy of the whole earth, is mount Zion [a part of Jerusalem], on the sides of the north, the city of the great King. God is known in her palaces for a refuge" (Psalm 48:2-3). "Out of Zion, the perfection of beauty, God hath shined" (Psalm 50:2). "Jerusalem shall be safely inhabited" (Zech. 14:11). "Jerusalem shall be inhabited as towns without walls [without the need of armed defense) for the multitude of men and cattle therein" (Zech. 2:4). The gates of Jerusalem will be open day and night (Isa. 60:11) so that the various peoples and nations can bring gold, silver and valuable materials into it. They will be richly blessed for doing this, and those who refuse will be "utterly wasted" (verse 12). All kinds of rare woods will be brought "to beautify the place of my [God's) sanctuary, and I [God) will make the place of my feet glorious" (verse 13). Jerusalem will be called "The city of the Lord, The Zion of the Holy One of Israel" and it will be made "an eternal excellency, a joy of many generations" (verses 14-15). "For brass I will bring gold, and for iron I will bring silver, and for wood brass, and for stones iron: I will also make thy officers peace, and thine exactors righteousness. Violence shall no more be heard in thy land, wasting nor destruction within thy borders; but thou shalt call thy walls Salvation, and thy gates Praise" (verses 17-18). "Thou shalt be called, The city of righteousness, the faithful city" (Isa. 1:26). Truly, "Glorious things are spoken of thee, O city of God" (Psalm 87:3)! Delegations from all nations will go up to Jerusalem to worship, to offer praise and thanksgiving, to be spiritually uplifted and inspired, and to receive instruction from God and His servants. "Jerusalem is builded as a city that is compact together [skyscrapers]: whither the tribes go up, the tribes of the Lord, unto the testimony of Israel, to give thanks unto the name of the Lord. For there are set thrones of judgment, the thrones of the house of David. Pray for the peace of Jerusalem: they shall prosper that love thee. Peace be within thy walls, and prosperity within thy palaces" (Psalm 122:3-7). "It shall yet come to pass, that there shall come people, and the inhabitants of many cities: and the inhabitants of one city shall go to another, saying, Let us go speedily to pray before the Lord, and to seek the Lord of hosts: I will go also. Yea, many people and strong nations shall come to seek the Lord of hosts in Jerusalem, and to pray before the Lord" (Zech. 8:20-22). This is what Jerusalem will be like in just a few short years! There is much, much more that could be said about Tomorrow's Cities. They will have for visitors delightful restaurants cheerfully and courteously serving sumptuous meals — without a sickening pall of cigarette smoke hanging heavy in the air. They will have no. obscene and violent movies — only clean, wholesome, entertaining, educational films — all under the supervision of God's government. They will present thrilling musical productions. They will have exciting recreational centers. They will have interesting, scintillating museums of art, science and natural history. Cities ought to be places where people go to be intellectually challenged, to be mentally stimulated, to be socially invigorated, to be culturally enriched and to be spiritually inspired! In the World Tomorrow, cities WILL BE this way. The big question for you is, will YOU be there to enjoy it? Will YOU have a part in making these cities fabulous places for people to live?